Home Porter Pickups Give Away! I’ve given out pedals, enclosures, cables.. so why not pickups! I’m really excited about this give away, and I think you guys will really dig this. 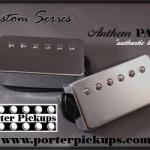 Basically, Porter Pickups is willing to give a set of hand wound pickups, but rather limit the type, they’re willing to give away a custom set to the winner! Porter Pickups has one Tele model, three Strat Models (50’s, 6o’s and Modern), five different Humbucker models, and they’re even offering a Porter Anthem PAF clones. Normally their sets range around $180 for most styles with the Anthem PAFs being a little more at $260. The winner will be able to choose the model they want, covers/bobbins and they’ll wind it just for the winner. 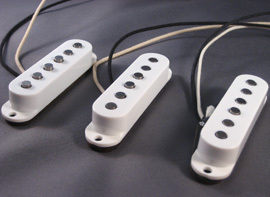 This way the pickups will match up with your style (wound hot.. not so-hot, etc). Okay, so now we’ve established… this is a pretty cool give away, I now want to talk about Porter Pickups since they’re being so generous with this sponsored give away! Porter Pickups is owned by Brian Porter and is located in Boise, ID. 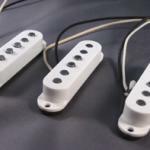 They have a wide selection of pickups ranging from humbuckers to Strat replacements to P90 replacements to Tele replacement to his Custom Series PAF pickups. Porter will also do custom orders as well. Along with offering great hand wound pickups, they also offer repair and rewind services for damaged or dead pickups, a good way to get your vintage guitar back in action! PorterPickups.com has a ton of stuff to go over. Plenty of clips and info, along with info on dealers, builders and artists. I also see that Brian has his own pickup blog. Okay, now to the give away. 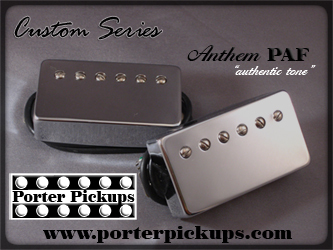 So how do you enter yourself to potentially win the Custom Porter Pickups Give Away? Second, fill out the form below, in two weeks (June 30th) I’ll randomly pick 3 entries as finalists. I’ll email the 3 finalists and the first one out of the 3 that emails me back will be the winner.You must enter a ‘valid’ email address, bounce back emails will be rejected. One entry per person (seriously people.. one entry per person). After the winner has been notified and all is good (I’ve retrieved mailing address, etc), I’ll coordinate with Brian at Porter Pickups to get the pickups built and shipped to the winner. This give away is open to everyone! Remember to also re-tweet this post and help spread the word! If we continue to have success with these give-aways, I’ll be able to offer more and more… and we all love free stuff right? T-Rex Twister 2 Chorus/Flanger Give Away Ends Tomorrow! This is an amazing give away idea. You’ve really outdone yourself! This would be for my daughter so I don’t know exact model but it is a Yamaha accoustic/electric. Quite a nice sounding quitar!